There are some things in life I just can’t explain – the fact that I’ve never done a post about the hot chocolate from Konditor & Cook is just one of those things. 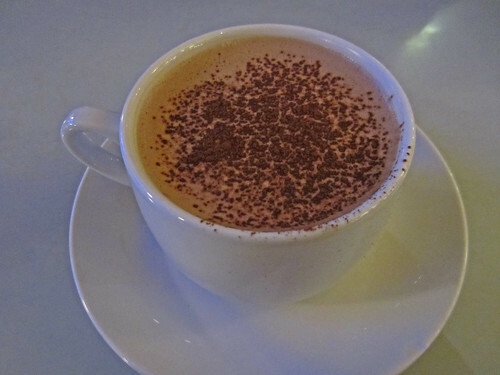 I first came across this hot chocolate when I worked at the Grays Inn Road store four years ago. I worked as a sales assitant for a month between jobs and had a great time. Not least because part of the training meant that I was able to spend 1/2 day in the kitchen at The Gherkin with the head chef. I was put in the savoury kitchen, rather than helping the bakers but I was able to see the effort and precision that is put into baking and decorting the large range of cakes that are on sale across all stores. Each store has it’s own kitchen where the cakes are baked freshly daily. It’s a big operation and you can sure tell. But back to the hot chocolate. It’s thick and creamy without being too rich and chocolatey without being too sweet. I know how it is made and believe me it’s not for the calorie conscious out there. Perhaps that’s the reason I put on a few pounds while I was working there, or could it have been the curley whirly cake, or the pecan pie perhaps. The list of Konditor & Cook goodies is endless. But if I could only recommend one thing, it would be the hot chocolate. Seriously, try it and let me know what you think. Click here for a list of locations around London.